CASY Caseys General Stores Inc.
A comprehensive guide to dividend investing that shows how to obtain double-digit returns with ease. Dividends are responsible for 44% of the S&P 500's returns over the last 80 years. Today they present an excellent opportunity, especially with investors who have been burned in the dot com and housing meltdowns, desperate for sensible and less risky ways to make their money grow. 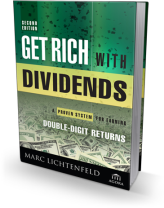 Designed to show investors how they can achieve double-digit average annualized returns over the long-term, Get Rich with Dividends: A Proven System for Earning Double-Digit Returns is the book you'll need to get started making money in any market.